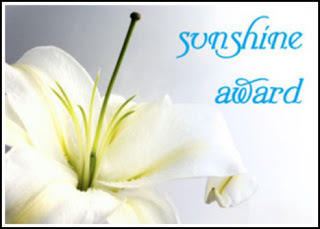 One of the most creative and nicest women of my online friends, Sherry Galey, who blogs at Still and All, has nominated myself and a few others for the Sunshine Award. Thank you, Sherry! WHY DO YOU CALL THE BLOG “STILL AND ALL”? For me, still is a lovely small word that contains many meanings and a great paradox. As a photographer, I love the meaning of “still” as a single photograph. But stillness is also where inspiration and art arises from. Still suggests not moving, silent, peaceful, calm, and undisturbed. At the same time, still relates to movement and continuity, meaning: always; ever; constantly; in the future as now and before. Sherry has even had a few of her pieces selected to be presented on Getty Images website for sale…such an honor! If you could learn one skill that you’ve never had, what would it be, and why? Music plays such an important role in my life, that I would have to say to say…Belting A Beautiful Tune would be magic for me. What do you love more…taking photographs or writing?This one is a no brainier to consider…hands down photography. Do you have a fear that you have not yet conquered? Do you have a dream you’ve suppressed due to life commitments? Definitely, a night owl…I could “Hoot” all night long reading a book in bed until the wee hours of the morning. What book has made a huge impact on you? If you could travel to any place in Canada, where would it be? Lake Louise…it is located in the most beautiful province of Canada-Alberta. What qualities most touch you in a person? What do you do when inspiration to create leaves you? This is a daily routine for me, so I don’t find myself in this situation…Enrich. All ideas start as tiny seeds in a person’s mind. Of course, many of them die quickly. Try to plant as many of these seeds as you can by enriching yourself with media. Listen to music, watch videos, read books, analyze articles and try new things every day! As you probably well know by now, I don’t normally fill out these questionnaires…it makes me feel a little uncomfortable, but I wanted to honor Sherry as an artist and the encouragement she gives to others. PS…this posted earlier today by accident without my answers. Sigh…forgive the double entry on my part. what wonderful answers to Sherry’s questions. I’m finally getting to visit everyone else’s blog to read the responses and I just did mine too. It was really nice to “get to know you” even better! Congrats, well earned!!! Congratulations, Laurie! I love that you won this award. Your idea of “enrich” to keep creative strikes a chord with me. So true! Congratulations, I can’t wait for the big reveal! I do appreciate that you made an exception about accepting awards Laurie! Thank you so very much for the kind words about me and my blog, Still and All. It has been one of the pleasures of blogging to get to know inspirational bloggers like yourself. And one neat thing about awards like these is that they do allow us to learn a little more about each other. Loved your answers, and I’m tantalized to hear more about your dream. I love that you keep striving to make your dreams happen. Have a great week! Oh I can’t wait to hear about the dream that is in the process of becoming a reality! Exciting!! Congratulations on the award. You have a beautiful blog! Pat, thank you for your kind words…especially from one so creative as yourself. I love learning more about you…such thoughtful answers!! Congrats on your award Laurie -Sunshine is a perfect award for you too! I loved reading this, Laurie! So nice to get to know you still more! You are a very neat lady! Congratulations on the Award, Laurie! I enjoyed reading your answers … I look forward of seeing and hearing more about your dream 🙂 and will check out the books you like! The “Still and All” is great…and congratulations! Congratulations, Laurie, and I so enjoyed reading the answers to the questions. I hope you’ve had a wonderful day! Congrats Laurie! Lovely answers to hard questions~don’t worry, we have all hit the publish button at the wrong time at least once! Well I am glad you took the challenge because it’s great getting to know you better….well deserved award…. Congratulations on your lovely award, Laurie. I agree with you about the gift of music being really wonderful. 🙂 I believe those two qualities you mention are the most important. Love your answers. So nice to get to know you a bit better. Congrats on the nomination ……. you certainly deserve THAT award.Ms. Sunshine! This was grand to read!! I love the idea to enrich and water the seeds. Have a great week! Congratulations–you certainly do bring sunshine to others. Thank you Sally so much. So well deserved, Laurie! Lots of questions to answer. I love how you went “hoot” I am the opposite! I am a super early am person!! Totally my fault…the post was NOT to be uploaded…I don’t know what went wrong.